Step inside to warm walnut flooring and your attention will be immediately drawn to the oversized “entry porch” foyer with floor to ceiling shiplap details and custom built-ins. 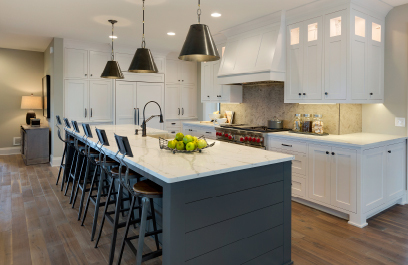 Cased openings introduce you to the kitchen, dining and living spaces, and draw your attention to a smart kitchen design that thoughtfully combines purpose with hardware, lighting, and fixture applications. The sleek eat-in kitchen with 13’ center island is the centerpiece of the home and plays on contemporary linear proportion with a twist on traditional aesthetics. Chef level Subzero Wolf appliances, Calcutta countertops and an open floor plan make this home perfect for entertaining. The great room showcases distressed wood ceiling beams, horizontal shiplap and leathered granite fireplace surround, with built-in media cabinets. Relax in the screen porch that includes a tongue & groove wood herringbone box vault ceiling inset. Large strategically placed windows allow an abundance of natural light into the home while taking full advantage of sweeping lake views. A sophisticated powder room layout sets the tone with a creative mixture of metals, Phillip Jeffries natural textured wall covering, furniture style vanity, and leathered granite countertop. Exposed white oak treads and risers with black metal balusters, and wool carpet runner offer a sleek and inviting access to the second and lower levels. Hardwood floors are carried throughout the second floor hallways and owner’s suite raised entry. Step inside the raised owner’s suite to find a vaulted ceiling, soft fireplace design, with lake views via panoramic window placement. Owner’s bath plays upon a bright, spa-like design showcasing heated floor, freestanding tub and a combination of glass and herringbone tile accents in the walk-in shower. The handsomely finished lower level continues the dramatic use of mixed metals; blending bronze and brass finishes which portray a casual sophistication. As you enter the lower level, your eye will be drawn to the built-in cabinetry with toe kick lighting details and wall finishes. The natural stone fireplace surround with raised hearth and distressed wood mantel invite you to relax in the family room. The real showstopper is the bar with contemporary cabinetry and finishes, and an integrated 210 bottle capacity wine cellar with full view frameless glass doors. Cambria countertops and smoked mirror glass backsplash are impressive. The lower level bathroom is another must-see with mature, organic rustic materials like the sliced rock shower floor, reclaimed wood-look porcelain floor, and accenting black and chrome hardware. The features, flow, and livability of this professionally designed custom home will leave you inspired. It pushes the boundaries of traditional and contemporary by incorporating dynamic aesthetics; mixing hard and soft, casual and refined, and modern and classic elements. From high quality finishes to unique custom features, it truly represents Homes by Tradition’s level of excellence. Stop by to visit us! Open to tour Thursdays-Sundays from 12-6pm or stop in during out two Saturday “Meet the Builder” Events – September 17th and October 1st!